In Portland, Oregon we are spoiled with the 60+ breweries that we have in the Portland metro area. Though Portland beer geeks always want more. One of the latest breweries to be added to the Portland scene is Vagabond Brewing’s Portland outpost. Although their original location in Salem, Oregon recently celebrated five years in business, people in Portland might not be familiar with their beer. Future home of Vagabond’s Brewing’s Portland brewery. 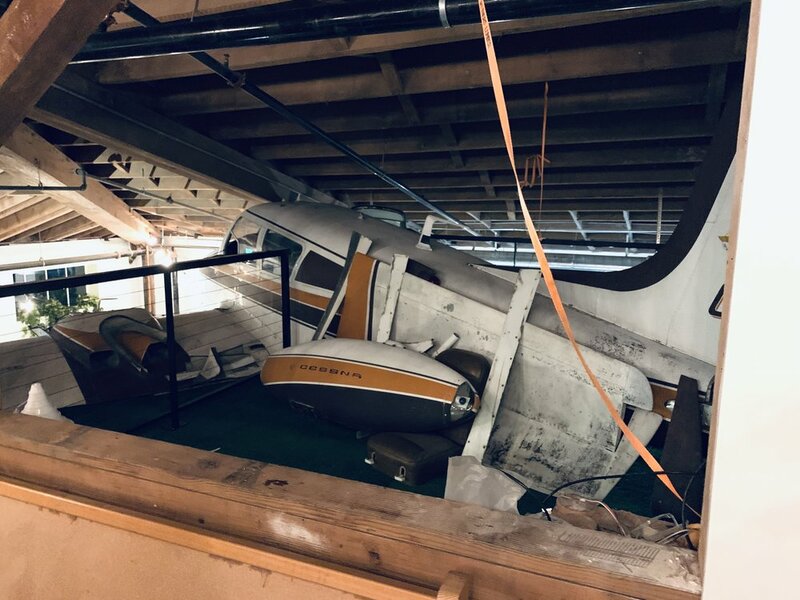 The 1958 Cessna 310B airplane helps set apart the decor of Vagabond from other Portland breweries. The long bar at Vagabond Brewing provides ample seating for thirsty patrons. Media and beer bloggers checking out the (at the time work in progress) Vagabond mural. Be sure to try their cocktails too. Beer Recommendation: Their flagship IPA, Attack Owl never disappoints. Vagabond offers everything from salads to pretzels and roasted chicken, but I recommend the Smoked Pulled Smoked Turkey Sandwich. shredded cabbage, fried onion, Dijon on a Ciabattai roll. The cost is $9 plus $2 for your choice of fries, soup or a side salad. Sunday-Thursday from 11am-10pm and Friday-Saturday from 11am-11pm. Follow Vagabond Brewing Portland on its website, Instagram, and Facebook Page.